Take a little more transit and eat a little less meat — two things you can do to reduce your environmental impact. In this installment of Meatless Mondays with Metro we head to Boyle Heights to try Un Solo Sol, a small restaurant that serves up traditional Latin American flavors. Even though it was ridiculously hot on the day I visited, I ordered the green pozole. I love pozole, and it’s not often I come across a version that doesn’t already have pork in it. The soup was really good and extremely filling, but I got a pupusa on the side anyway because I’m a sucker for pupusas. Normally I get loroco and cheese — loroco is a type of edible flower — but to try something new, I ordered the nopalitos and cheese — nopalitos is a type of salad made of prickly pear catcus. It wasn’t as good as I hoped it would be, but then I had burned my tongue on the soup before eating the pupusa, so perhaps my taste buds weren’t at their best. If you’ve tried their nopalitos and cheese pupusa, let me know how they were. 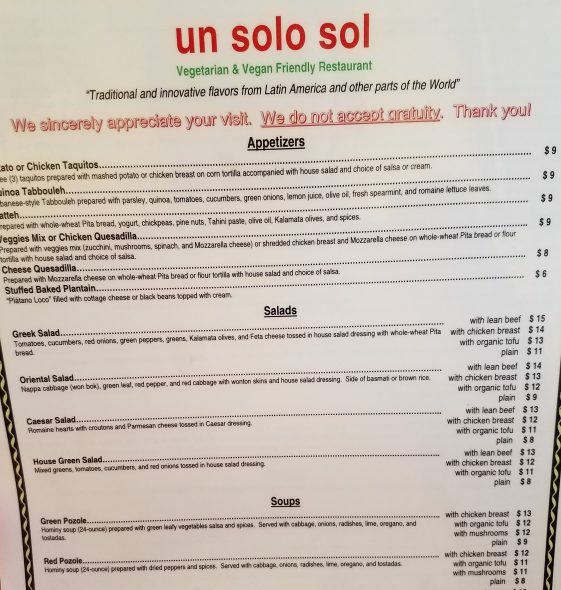 The prices at Un Solo Sol are pretty affordable, and the other thing that makes them stand out is the fact that they do not accept gratuity. That’s right, you can’t tip if you eat there. I think it’s the first time I’ve been to a restaurant in Los Angeles that doesn’t allow tipping, so that was also a new experience. To get to Un Solo Sol, take the Gold Line to Mariachi Plaza Station and then walk across the street. You can also take Metro Bus 30 to 1st/Boyle. meatless Monday at Sol y Solo? I don’t think so. There website has them closed on Mondays & Tuesdays.